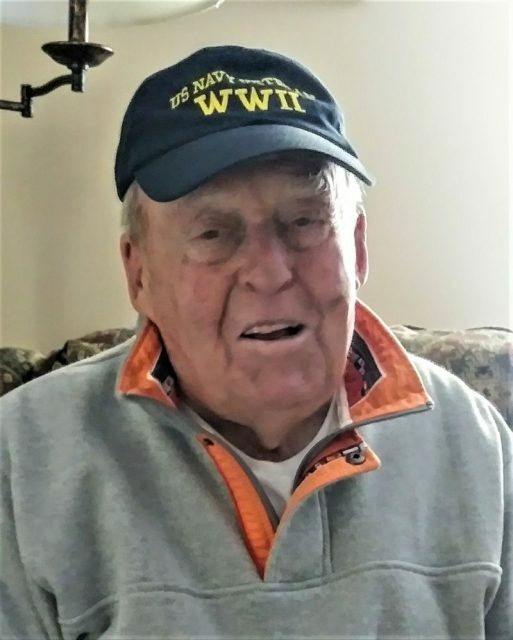 Decades before he was inducted into the Missouri Sports Hall of Fame for his success as a high school football coach, John “Pete” Adkins collected a treasure trove of experiences with his first team—the U.S. Navy—in World War II. These days, however, when it comes time to assemble a team, it is in support of veterans’ events to honor those who never made it home from the war. A 1943 graduate of Mexico High School in Mexico, Missouri, Adkins and a small group of friends decided to enlist in the U.S. Navy before the military draft process made the decision for them. 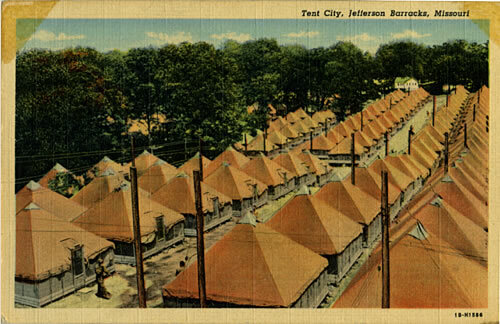 Jefferson Barracks Basic Training Camp during World War II. For the next eight weeks, he and his fellow recruits underwent their initial training. 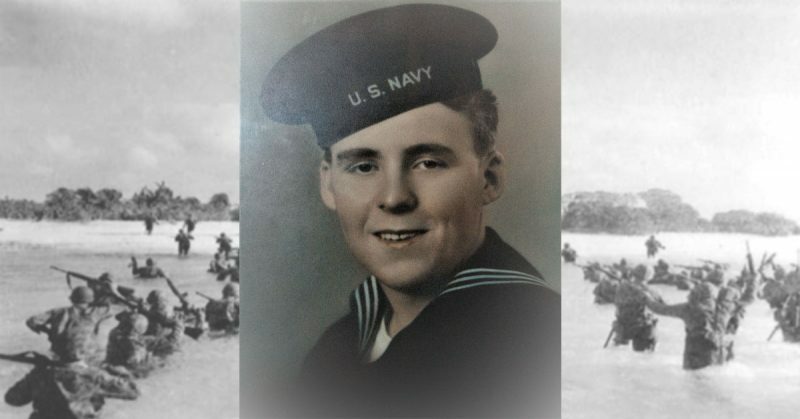 When many of the trainees began to depart for additional training at other locations, Adkins remained at the Idaho base for another eight weeks to become a signalman—a specialty, he recalled, that the Navy selected for him. Much of their training, he recalled, was spent in the classroom learning skills such as communicating letters of the alphabet using flag signals known as “semaphore.” Additionally, they spent time in a mock signal tower demonstrating they had acquired the skills necessary to direct harbor traffic. 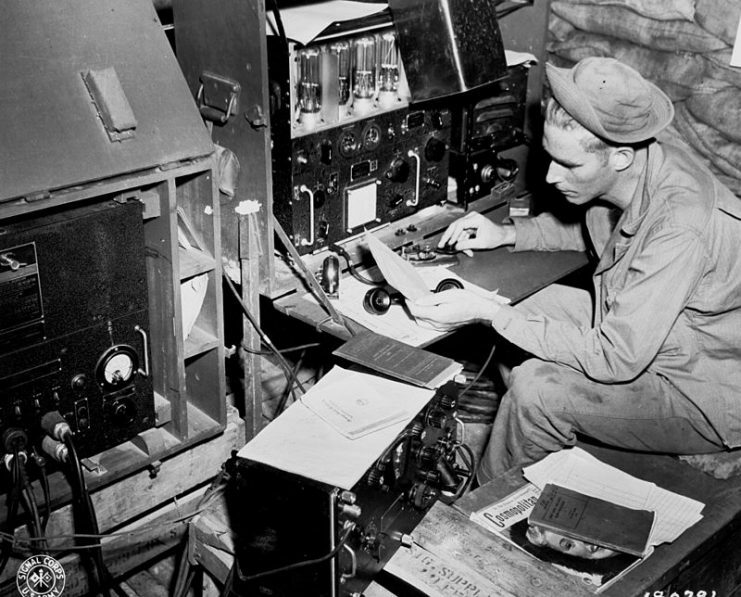 Radio Operator transmitting by radiotelegraphy tapping on a telegraph key which turns the transmitter on and off, transmitting pulses of radio waves which spell out a text message in Morse code. From there, the untested sailors were transferred to San Pedro, California, to apply their new skills in a live training environment. They spent additional training time in San Francisco before traveling to Treasure Island in San Francisco Bay, where they received an issue of uniforms, weapons and equipment. They were then sent into the mountains for a brief period of training by the Marines, much of it focused on weapons familiarization, before traveling to Shoemaker, California, to board a troop ship. Following an overnight stop in Pearl Harbor, Adkins and his fellow signalmen sailed for the Marshall Islands in the central Pacific. They arrived in late March 1944 on the Eniwetok Atoll, which had been the site of a brutal battle a month earlier. 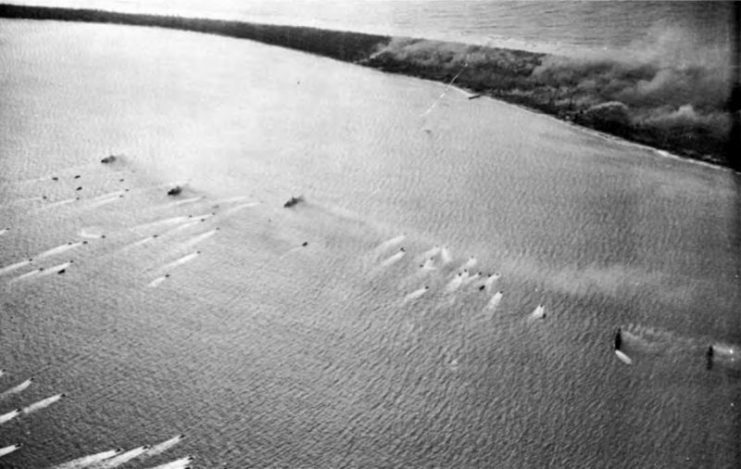 Landing craft pass supporting warships in the Battle of Eniwetok, 19 February 1944. As the former sailor explained, the Japanese prisoners were soon moved elsewhere but he remained on Eniwetok, spending the next two years applying the signal instruction he had received stateside by directing naval traffic in the harbor. 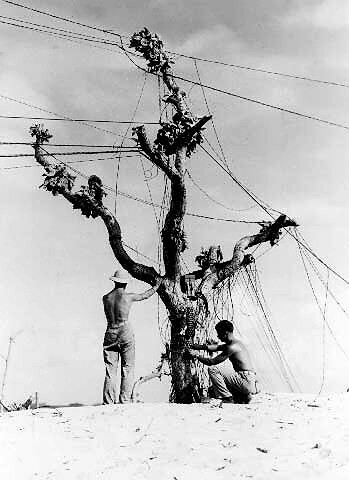 Communications men string telephone wire on a tree on Enewetak Atoll, Marshall Islands, circa 1944. In the early days of August 1945, an assortment of naval vessels began to assemble in the harbor, leaving Adkins and his fellow signalman to speculate that a major military operation was in its beginning stages. Eniwetok landing. 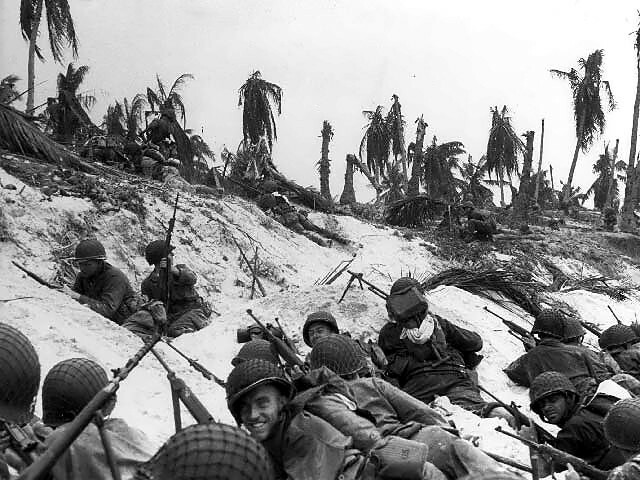 US soldiers on the beach awaiting orders to attack. Remaining on Eniwetok until March 1946, Adkins returned to the United States and was discharged on April 3, 1946. After going home to Mexico, he married the former Lorraine Fenner in 1948 and utilized his G.I. Bill benefits to earn his master’s degree in education. As the years passed, he became head football coach for Jefferson City High School, retiring in 1995. Throughout the course of his 45-year career, he compiled a 405-60-4 record, resulting in his induction into the Missouri Sports Hall of Fame in April 2013 for being the most successful high school football coach in the nation. His victories on the gridiron notwithstanding, Adkins values his service in the U.S. Navy and maintains it helped instill the lifelong aspiration to recognize his fellow veterans while also refining many positive qualities he has embraced throughout his career. Jeremy P. Ämick writes on behalf of the Silver Star Families of America.